We offers Durometers Shore A & D ( Export Model) And Shore A & D (Basic Model). 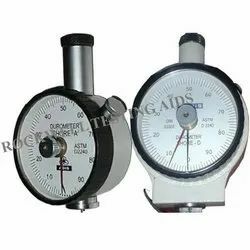 Durometers Meet the Standards: DIN53505 & ASTM D2240, Measuring Range: 0-100 Units; Accuracy : ± 1 ½ Durometer Unit; Indentors are made of HSS; Plungers are fitted with linear Bearings, Contact base surface is ground and hard chrome plated. · Contact points are fitted with tungsten carbide balls. · A solid and rigid outer case helps protect the inner gearing. · Movement is fitted on a thick brass plate with jewel bearings. · Fixing stem is standard 8mm h6, made from stainless steel and is accurately ground.